Could Canada be self-sufficient in energy and control its own energy fate? It’s Canada.There are extreme energy challenges. With the price of oil at an all-time low coupled with Canada’s number one client becoming more and more oil independent (The USA), on top of that globalization and market share is tighter, the dollar is down, and simultaneously there is a brand new government in play. All of this coupled with rapid advances in technology means, there is a lot happening. We are living in the most amazing times yet with the current challenges we are simultaneously in a massive state of disruption and people are feeling it. For some, it’s good news at the gas pumps with lower transport costs. 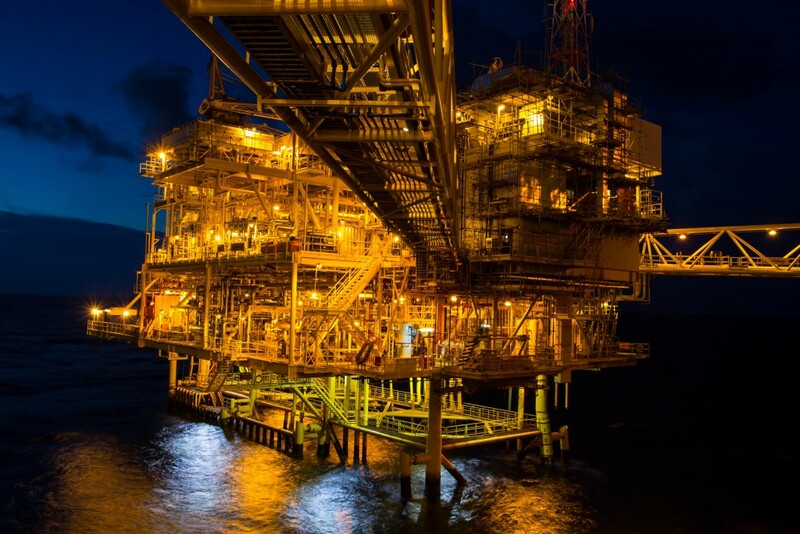 For other’s supporting the oil and gas sector, it’s a tumultuous time. Western Canada has seen the highest number of layoffs ever and eastern Canada’s offshore industry, could be booming but projects are status quo. The good news is, out of such dramatic economic breakdowns come breakthroughs. The energy industry is focusing on efficiency. Adjustments are being made. Companies are getting lean and streamlining. There’s no room for waste. Innovations are solving the issues of the day. This era of upheaval and uncertainty has given rise to some clear indications that energy self-sufficiency is important for Canada and its sustainable future. So what’s it going to take to get there? Could the answers be in a trans-Canada pipeline for energy independence? If Canada was a business would the owners make it profitable with energy? Before we look into energy independence in terms of a “to do” list of must do’s, let’s take a look at what it takes as a philosophy, a level of commitment and way of thinking that would have energy matters come fully under control for Canadians. Successful business people know that, if it’s going to happen, it’s up to them to make it happen. Partnerships are extremely important but what’s even more important is the ability to be self-sufficient and make it happen on our own. Success then depends singularly on us, our business and on the people working in our business. This is a powerful position to adopt because no matter what happens we don’t give our success potential away to others and that’s when we are truly in control. So our success is a matter of responsibility. Not like a moral obligation but rather the “ability to respond” to the challenges of the day. 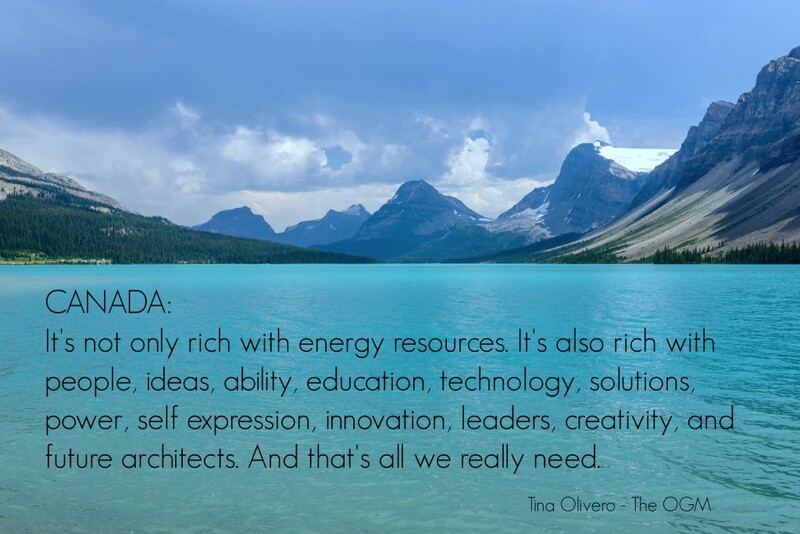 Respond by designing an environment that supports us in finding solutions. Respond by building the culture that allows team members to overcome challenges. Respond by fostering corporate conversations that have each individual make the difference. Respond by building the systems that support and make things happen. Respond by hiring smart creatives who shape the outcomes in all the right directions. Respond by instilling the attitude and the determination needed to beat the odds. Respond by educating and coaching for peak performance and a constant state of improvement. Respond by instilling the fundamental understanding that each person in the organization has the power to shape the future. And then they do. So before anything happens there can be no blame of energy companies, no finger-pointing of the past, and no government back-stabbing that justifies a lack of action, the country simply has to get on with it. That’s the starting point for Canada’s energy independence. What does is take to be a self-sufficient nation? Take the concept (100% responsibility for the outcome) and now apply it to Canada. What would happen if we operated from the premise that no matter what, Canada was going to make energy independence happen? Canada would be a different place. The energy industry as we know it would completely transform. But is it really feasible to build a Trans Canada Pipeline for Energy Independence? Canada is the fifth largest producer of energy in the world. Canada is a global producer of hydro-electricity, a global player in petroleum, natural gas, and coal. Canada is a world energy leader and only Russia, the People’s Republic of China, the United States and Saudi Arabia produce more energy than Canada. It’s safe to say that Canada has the means to be self-sufficient and self-sustaining. With billions of dollars of investment, exploration, production and delineation of petroleum in Canada, the region is only fractionally explored and producing. It is predicted that by 2025 the oil sands coupled and other unconventional oil resources, and eastern Canada’s offshore, could place Canada as the world’s top oil producing and exporting nation. What’s it going to take to get us there? Much like the analogy of the oxygen mask on a plane, you must put on your mask first and then help others. Canada has been producing oil for over 120 years and has a vast understanding of the industry and how to produce, transport and sell oil. Given this it’s Canada’s responsibility to take care of its own energy needs first and foremost and then serve the world. Given the economic challenges, do you think it’s time that Canada puts on its own oxygen mask and starts to breathe a little easier again? What is Canada’s energy potential? Although the conventional oil and gas industry in western Canada is mature and there is an unprecedented track record or expertise in the industry, overall the country’s Arctic and offshore petroleum resources are mostly in early stages of exploration and development.Eastern Canada has only been producing oil for about two decades, and it has just begun. Canada became a natural gas-producing giant in the late 1950s and is second only to Russia in exports. Canada is also home to the world’s largest natural gas liquids extraction facilities making it a world class industrial innovator. The oil industry started constructing oil pipelines in the 1950s and has the potential to create a trans-national pipeline in the interest of self-sufficiency. In 2014, the US Energy Information Administration (EIA) ranked Canada as third in World Oil Reserves at 175 billion barrels, while Saudi Arabia is 2nd with 268 billion barrels and Venezuela is ranked first with 297 billion barrels of reserves. Clearly Canada doesn’t have that far go, to be self-sufficient and quite possibly number one in the world as an energy producer and exporter. Canada has the world’s third-largest oil reserves, but refineries in Eastern Canada still import approximately 80 percent of its oil from places like Saudi Arabia, Iraq, Norway, Algeria and Angola. What would happen if we no longer did that? Is Canada, Canada’s best client? Canada is both an importer and exporter of coal and petroleum because its major coal and oil fields are located primarily in Western Canada, which geographically is far removed from its main population and industrial centers in Ontario and Quebec. Many of Canada’s oil refineries cannot handle the types of oil produced in Canada so the nation requires an industrial facelift. Federal government initiatives, incentives, and support can focus on trans Canada pipelines and new advanced refineries that will support the self-sufficiency of the country. 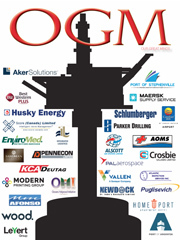 Eastern Canada, offshore projects have the potential to be world class. Offshore Newfoundland and Labrador hold the promise of resources that resemble that of the North Sea, and with the appropriate support and commitment, projects can be fast-tracked to make Canada’s on-land oil resources in the west, and it’s offshore resources in the east an unprecedented winning formula. What will it take to link the east to the west? Refusing to import foreign oil would be a game changer for Canada. If it were to happen the goal then would be to unite the west with the east and strategically reposition the purchase and export potential of the country. 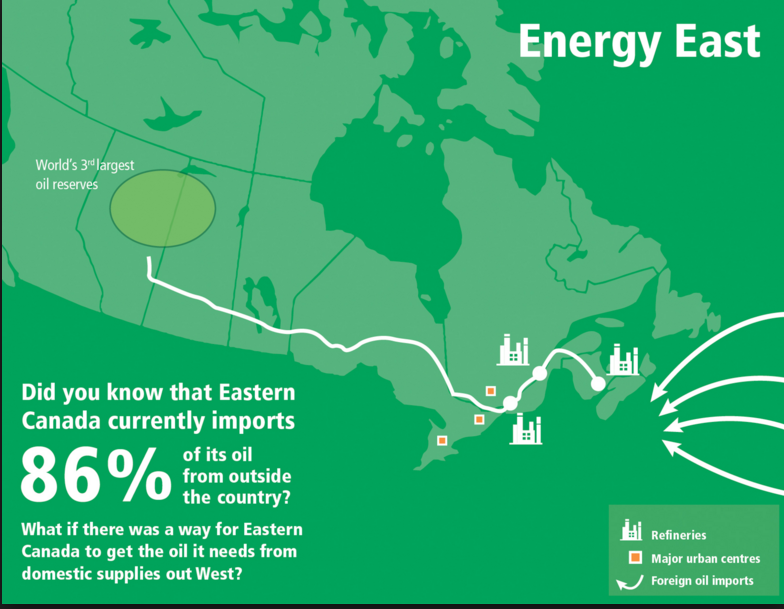 One of the most promising propositions to date that would support that goal is to develop the Energy East Pipeline. 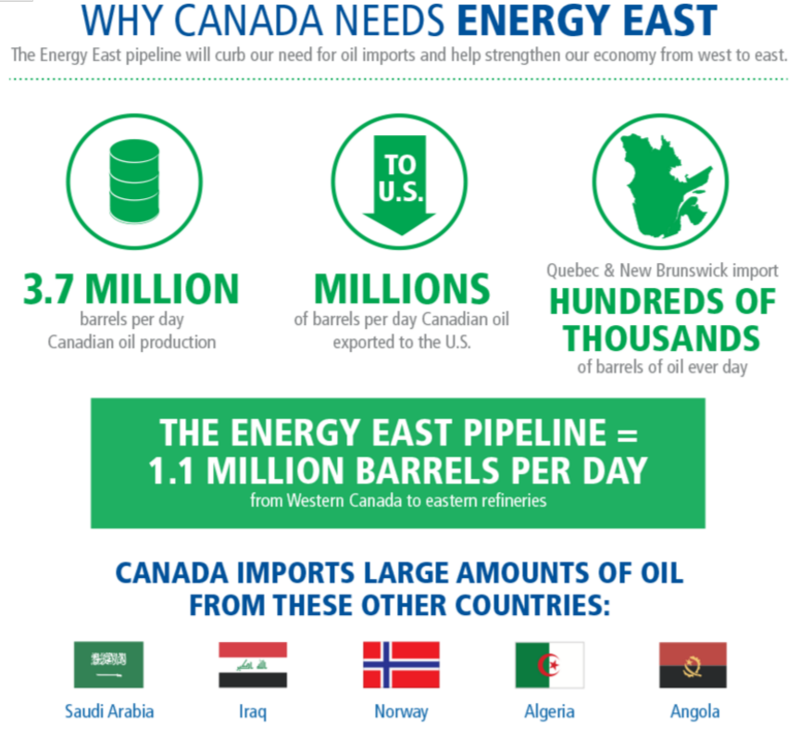 The Energy East pipeline would eliminate the need to import foreign oil and it would join western and eastern Canada creating oil supply which will support and secure Canada’s energy independence. From Alberta to Quebec to New Brunswick, the Energy East pipeline connects Western Canada’s oil resources with industry centers in the east making it one of the countries most unique proposed energy plans to date. In 2014, TransCanada submitted a formal application for a permit to build the Energy East Pipeline.The proposal consisted of a 4,600-km pipeline project that will transport about 1.1 million barrels of crude oil per day from Alberta and Saskatchewan to the refineries of Eastern Canada and a marine terminal in New Brunswick. “Converting an existing natural gas pipeline to an oil transportation pipeline, Constructing new pipelines in Alberta, Saskatchewan, Manitoba, Eastern Ontario, Québec and New Brunswick to link up with the converted pipe, constructing the associated facilities, pump stations and tank terminals required to move crude oil from Alberta to Québec and New Brunswick, including a marine facility that enables access to other markets by ship. What happens if Canada loses its biggest client? For decades, Canada has thrived on the good fortunes of the oil and gas industry but with the price of oil as it currently stands the industry is on shaky ground. This coupled with rapidly growing levels of oil production in the United States and the fact that Canada virtually has nowhere else to sell oil right now, makes Canada extremely vulnerable. The possible solution could be to make Canada, its own best client. 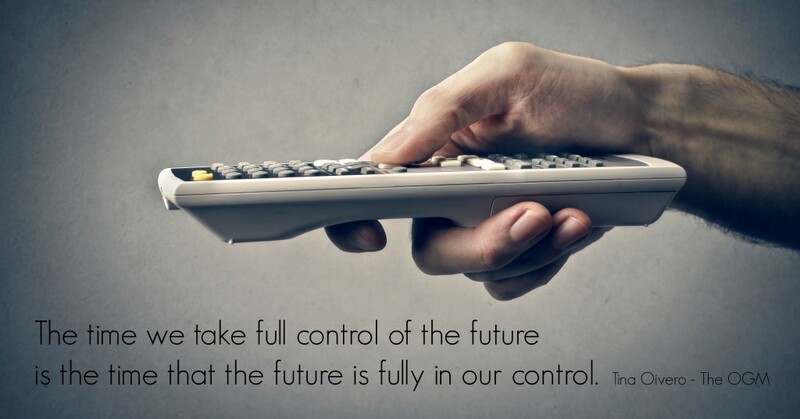 We should be producing and consuming our own energy. 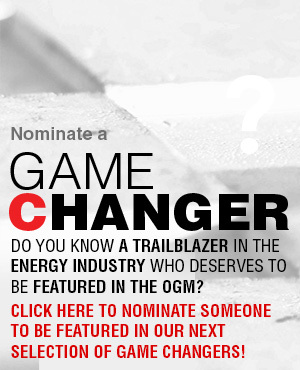 Projects like the Energy East pipeline, developing offshore Newfoundland, and new energy projects, make that possible. The IEA expects China’s energy demand to grow 60% by 2035, and India’s to double. Canada can be powerfully positioned to capitalize on the growth. The drive to build pipelines and export terminals to the Pacific Ocean is becoming more attractive every day. The trend setting in for many regions of the world is self-sufficiency in energy supply. This coupled with rapid technological advancement in the energy industry, will transform global market sales. 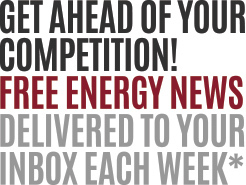 We can expect to see the global energy markets change dramatically over the next decade. Canada’s oil and gas exports to the U.S., worth $92 billion in 2010, account for more than half of Canadian production of those commodities—and nearly a quarter of Canada’s total merchandise exports. Ensuring that Canada doesn’t have most of its eggs in one basket is the strategic next step. In June of 2015, the Canadian Association of Petroleum Producers projected the oil sands will yield five million bpd in 2030. The prospect of self-sufficiency in the U.S., virtually the only export market presently, means Canada has to move fast. While it’s unlikely Canadian producers will be shut out of the U.S. market, they may have to fight much harder to keep market share. Once we are self-sufficient, what’s next? It’s clear that there is an argument for energy self-sufficiency in Canada. Let’s say it actually happens. Then what? Once Canada has hit the sweet spot and is self-sufficient in energy, it can then become an exporter of its energy commodities. For example, today the United States is Canada’s major trade market for energy products and services. 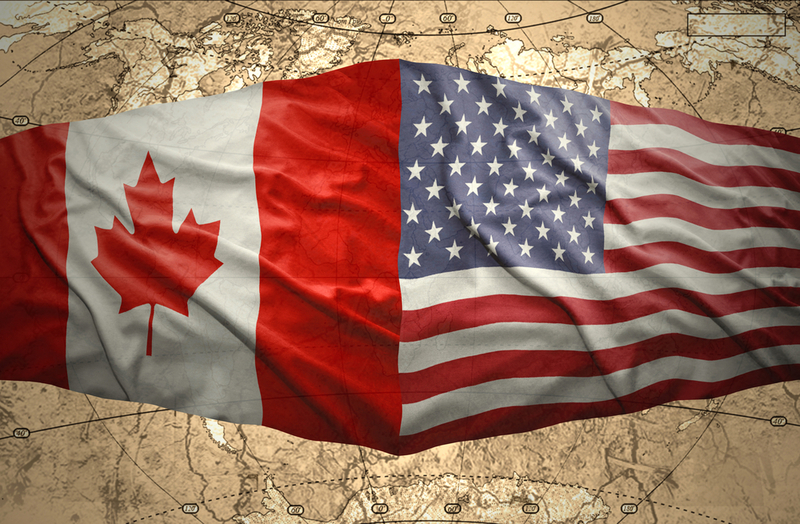 Right now, Canada sends about 98% of its total energy exports to the United States. That makes Canada the largest supplier of energy exports to the world’s largest economy – the USA. Canada can build on that current infrastructure but what if the U.S. fracking play is so successful that the U.S. no longer needs Canadian oil? Canada also exports significant amounts of uranium and coal to Asia, Europe, and Latin America. New alternative energy opportunities are on the rise. Now more than ever with lower oil prices, new energy is becoming an economically viable alternative. As we globalize there will be fast approaching new markets abroad that will require new energy solutions. Being world leaders in wind, solar, tidal, geothermal and biofuels will position Canada to become a variance of energy solutions all of which add up to the positioning of Canada as a highly profitable self-sufficient nation. Making that happen would mean an aggressive approach to taking back full control of Canada’s energy destiny. The world advances with energy. Would you agree? Self-sufficiency as the foundation of a national energy plan will position Canada for profitable gains. It will also mitigate risks based on market demand, economic downturns, and political turmoil. It will provide the foundation for national security, economic prosperity and pave the way for selling energy in other global markets. Energy makes the world work and it is the foundation of the global economy. Once energy works everything works. More about me and how to get in touch! Yes, I would like a consult on new business development solutions, with The OGM! Fill out this request and I will give you a free consult on achieving your business development goals. After all, marketing is not marketing unless you sell something!